We didn't think it would be Acer who would set a new standard for Ultrabook design, but credit where it's due, the Aspire S7 is one of the most stunning laptops we've seen in recent years. Dual-torque hinges, an impossibly-thin body and a Gorilla Glass top combine to create a chassis that's extremely well built and beautiful to behold. 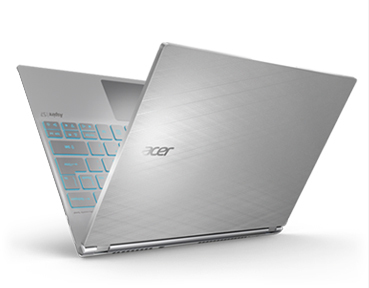 Acer has designed an ultrabook that’s thin, light, attractive, sturdy, and powerful. But it’s not a perfect portable computer. 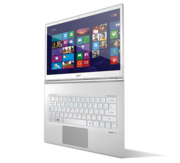 The Acer Aspire S7 is hampered by lousy battery life, an odd keyboard, a high-resolution display that’s both a blessing and a curse (depending on how you use it), and a jet engine-like exhaust fan. If you’ll pardon my slaughtering of Neil Armstrong’s famous quote from the moon landing, there are two areas I want to focus on for the conclusion. 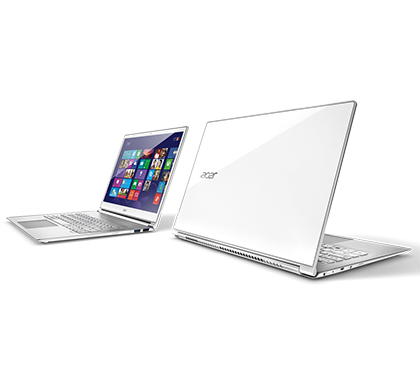 First, there’s what Acer has done today relative to the Acer of years past; second is how the end result of those efforts compares with what other companies are doing. In its definition of what qualifies as an ultrabook laptop, Intel says an ultrabook with a touch screen is allowed to be 2mm thicker than one without. 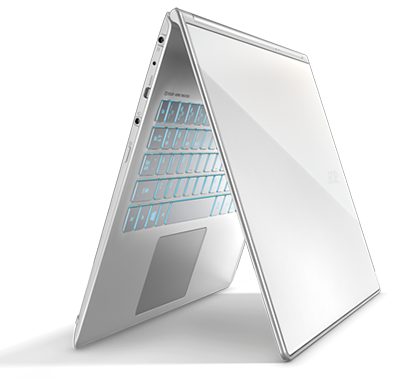 Astonishing: The thinnest and sexiest ultrabook we've seen is a touch-screen showpiece for Windows 8, as speedy as it is convenient and a sure-fire hit for the executive suite. But it's not cheap, and battery life could be better. 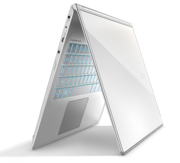 The slim, premium-feeling Acer Aspire S7 was one of the very first Windows 8 laptops I spent a significant amount of time with in the weeks before the official release of Windows 8. 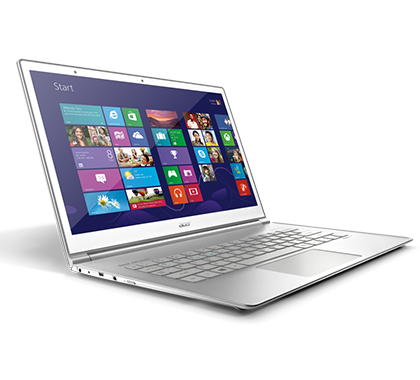 One of the few standout products from the first wave of Windows 8 laptops, the Acer Aspire S7 proves that Apple does not have a monopoly on great design. 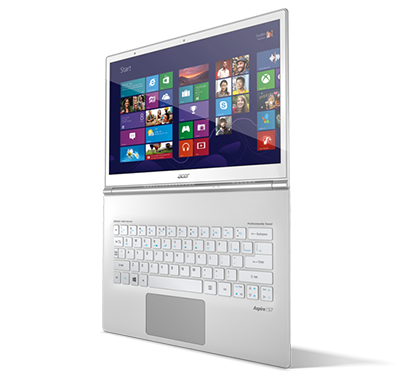 With each successive generation, Acer comes closer to building the perfect Ultrabook. Its first model, the S3, had a low-rent feel, with short battery life, trailing performance and a stiff trackpad. The S5 improved on that with a nicer design and blazing speeds, due to a RAID 0 disk setup. But thanks to a low-res screen, among other shortcomings, it ultimately felt overpriced for what it was. 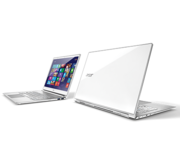 The Acer Aspire S7-391-9886 is a media performance laptop for the traveling artist, similar to the main audience for the Apple MacBook Pro 13-inch (Retina Display) and the current Editors' Choice for ultrabooks, the Asus ZenBook Prime UX32VD-DB71. All three give you 1080p (or greater) resolution in a 13-inch portable package, as well as good multimedia benchmark performance. The S7-391-9886 is certainly the way to go if you want the slimmest possible touch-screen system to commute with you on the train. However, the other choices may be better if you're a plane commuter, since they have better battery life overall. The Asus UX32VD-DB71 in particular comes with discrete graphics and a much less dear price tag of $1,299. Even the other Windows 8 systems with touch screen (Dell XPS 12 and HP Envy TouchSmart Ultrabook 4t-1100) have better battery life than the S7-391-9886. Again, if you have $1,700 to spend, you'll probably be happy with the S7-391-9886, but for a little more ($200), you're in upgraded MacBook Pro 13-inch (Retina Display) territory. And that laptop will make it through a continental plane trip with many minutes to spare.